Last Night at the Florentine Gardens in Hollywood, California, reliving the Glory Days and Golden Era of East Coast Boxing of the late 40s and early 50s, Art of Boxing Promotions and Bash Boxing Promotions jointly presented the debut of "Hollywood Fight Night" with 9 pairs of 4-rounders, featuring up and coming fighters from prominent boxing stables in and around California. 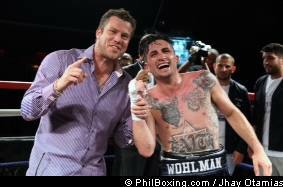 In the main event, Zachary Wohlman cruised to his 4th win in as many fights with a unanimous decision over Jose Martell in their welterweight duel. Wohlman was just too slick and quick for the aggressive but plodding Jose Martell, who kept lunging in with wild bombs, hoping to land a knockout punch, in vain. Instead, Jose Martell got peppered with one-two combos to the face each time he tries to come in, from a calculating Zachary Wohlman who was always able to keep a step ahead and stay out of harm's way. Scores read 39-37, and 40-36 twice. In the other bouts, Junior Middleweight Terrel Williams knocked out Cliff Mcpherson in the first round. A crisp body shot by Williams sent Cliff Mcpherson down to the canvas grimacing in pain as he was counted out by Referee Tony Crebs. In a Super Welterweight battle, brave but heavily outbombed Japanese Tatsuro Irie was not allowed by his corner to continue at the end of two intensely fought rounds on advice of the Ring Physician because of a swollen eye, and lost by TKO to Javier Albonica. Debuting Cruiserweight Paul Parker made an auspicious 1-0 record start with a first round knockout of Larry Ward, who had regaled the crowd with his pre-fight dancing, from the time he walked up to the ring up to the introduction and mid-ring instructions by the Referee. Midway to the opening round, Paul Parker suddenly clipped Larry Ward with a short powerful cross as they were about to clinch, after which Ward appeared to have been accidentally pushed to the floor. He stood up, however, on wobbly legs and, shortly, a rain of head blows put him down for good. In a very entertaining Super Bantamweight battle, crowd favorite Erik Ruiz eked out a majority decision victory over wily Raymond Chacon to remain unbeaten at 5-0. Judges' scores were 39-37 twice, and 38-38. Junior Middleweight Liam Vaughan of Liverpool, England, but fighting out of California, tamed the bull rushing tactics of rugged Jiovanni Rubio to score a unanimous decision, 40-36 twice and 39-37. Lightweights Oscar Diaz and Carlos Morales battled to a majority draw with scores of 39-37 and 38-38 twice. 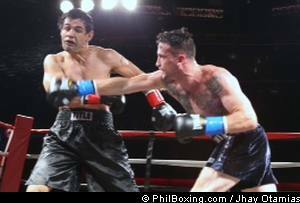 Junior Welterweight Mike Caracella beat Alonzo Loeza by a unanimous decision. Scores were 39-37 across the board. The youthful and gangling Mike Caracella snagged his second straight win, while Alonzo Loeza's record dipped to 1-6-1. And, in the only female fight of the evening, Canadian Junior Welterweight, Holly Lawson knocked out Judy Garcia in the 3rd round. The event has been sanctioned by the California State Athletic Commission. Click here to view a list of other articles written by Jhay Oh Otamias.